Ten years ago today, I was bored. And probably a little buzzed. That’s nothing new on?either front, but on May 16, 2005, instead of putting on a movie or goofing around online?or frittering away my time in some other unproductive way, I decided on a different alternative. I’d been collecting cocktail books for a couple of years by that point (this was at a time when you could still pick up a copy of Charles H. Baker’s Gentleman’s Companion for under $20, with ease), and playing around with old recipes each evening — tonight, I thought, I’ll try to put some of that info together in one place so I’ll stop losing notes and recipes in the shuffle of paper on my desk, and possibly, just possibly, wind up putting together a body of writing that could maybe lead to a paid gig. 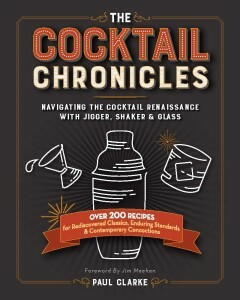 The Cocktail Chronicles launched 10 years ago today with a readership of one, and that’s pretty much what my numbers have fallen to now, considering I’ve only posted a half-dozen times over the last few years. But the hoped-for did happen — the hobby became a career — and while laziness is certainly a?reason for the lighter load of posts in recent years, I’ve also found many other outlets over that time for diving into my drinks writing. The book is inspired by this blog, and contains a flurry of recipes (200-plus) for drinks both old and new, ranging from early favorites of mine such as the El Presidente (the focus of my first cocktail post here, which went up two days later) to some of the countless creative approaches to drinks that have blown up during the cocktail renaissance. I’ll be posting more on the book and on events related to it in the weeks to come, but for now, I wanted to dust off the Cocktail Chronicles, get it out on the road a little to make sure the engine still runs, give a short and mostly sober nod to the anniversary of me making what turned out to be a very good decision, and convey a quick word of thanks to everyone who’s spent time on this site over the past decade. I hope you’ve found something useful or least amusing, and stick around — there’s more to come. Great news! But, the link to Amazon seems to be broken. Congratulations on ten years of inspiring articles. I look forward to reading your book.